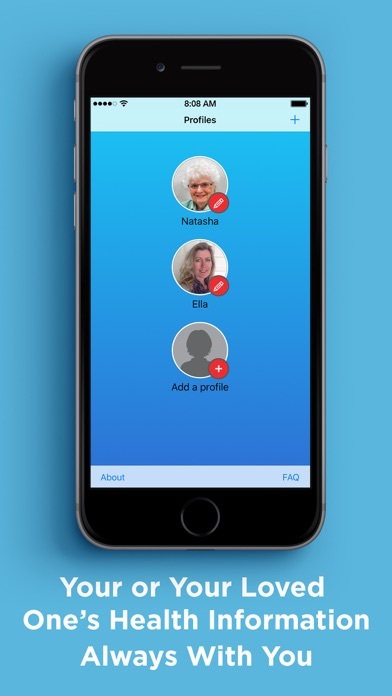 Our team of physicians and technologists has designed iBlueButton to serve Medicare beneficiaries, Veterans, and Military families, for them to have at all times their medical history in their hands, enriched with personalized medical care guidance and important health safety warnings. 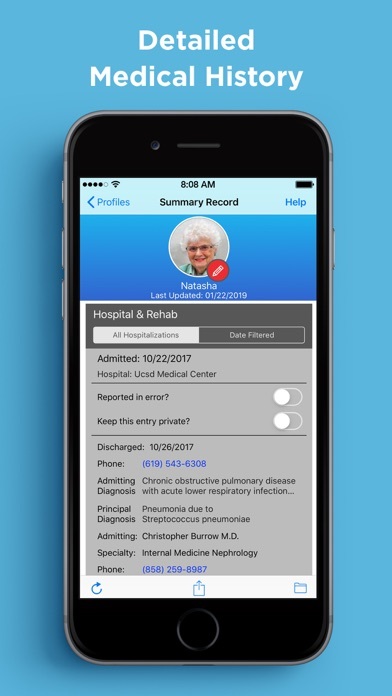 iBlueButton will help you better manage your healthcare, avoid preventable medical errors, and avoid unnecessary care. iBlueButton has won multiple awards over the years including the U.S. Department of Health and Human Services Industry Innovation competition for its Blue Button program. 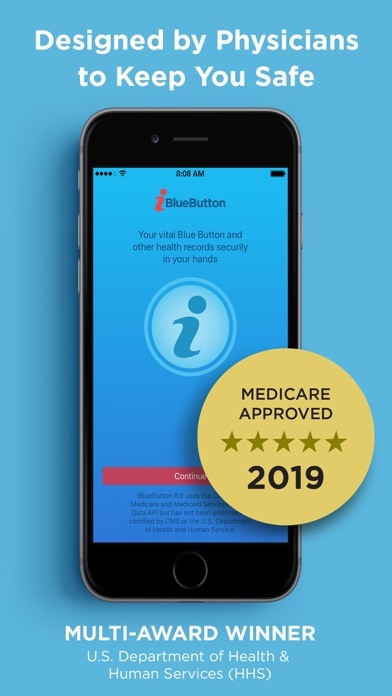 iBlueButton is the first Medicare approved native mobile Blue Button application, and you can find the app listed on the Medicare.gov website (go to Manage Your Health). For Medicare beneficiaries & their family caregivers, iBlueButton lets you automatically login into their MyMedicare.gov account to retrieve their medical claim history which is then automatically translated into an organized medical history with lists of medications, conditions, immunizations & allergies – and a detailed medical history (with physician visits, hospitalizations, tests and procedures, etc.) for you to review, research, annotate, share and print. iBlueButton can also retrieve MyHealtheVet and TRICARE Blue Button health records, assembling them into its interactive Summary Record. 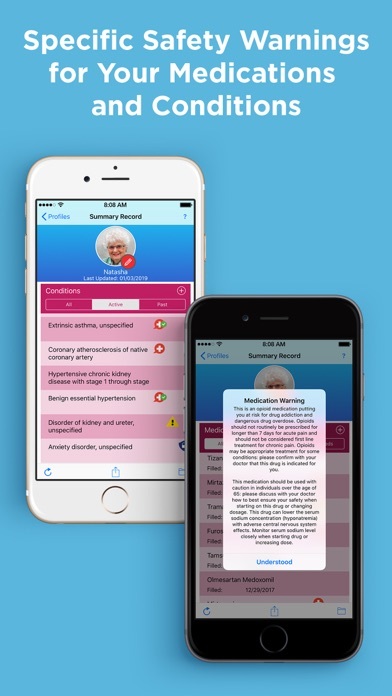 Importantly, iBlueButton generates safety warnings about your medications and recommended best practices for your medical conditions. 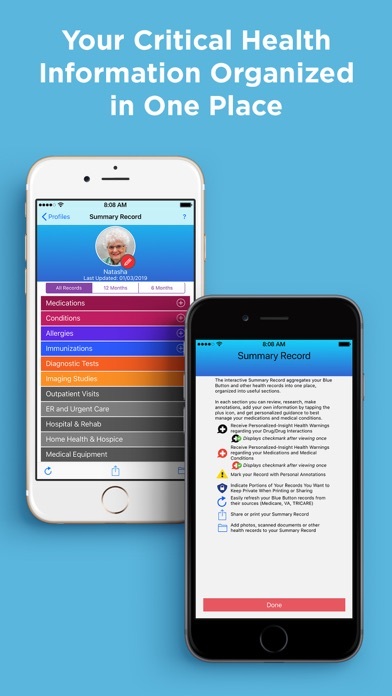 At the physician’s office or in the emergency room, be prepared with all the information you need securely organized and stored by iBlueButton on your smartphone or tablet. 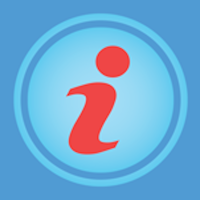 iBlueButton pulls and organizes your Medicare and other records with all critical information in easy to view sections. Your medical history is available for you at all times to review, research, understand medical terminology, annotate, and select the specific information you want to share. 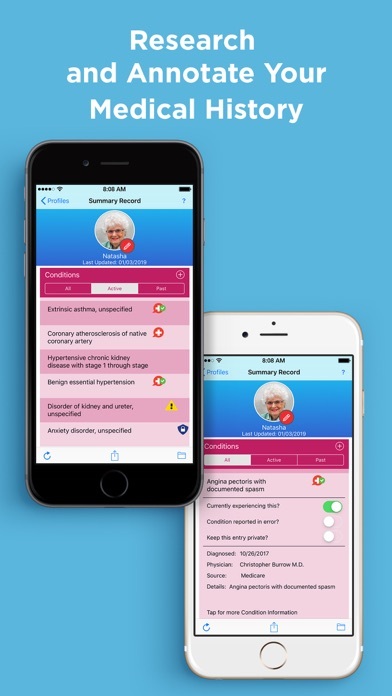 iBlueButton automatically generates important safety warnings about your medications to help you prevent adverse drug effects, alerting you about highly-addictive opioids and of potentially dangerous drug-drug interactions, or medications which should be avoided if you are over the age of 65. iBlueButton also provides professionally recommended medical care guidelines for common chronic conditions. On average, a Medicare beneficiary sees seven different physicians a year, with most physicians not having the full medical history of their patients, which can cause medical errors, unnecessary tests, and avoidable healthcare expenses. Veterans and military families experience these same healthcare issues, as their care takes place in both VA and private-sector facilities. iBlueButton helps you prevent dangerous medical errors by having with you, anytime and anywhere, your critical medical history. Unlike most personal health applications, iBlueButton only stores your information securely on your own mobile device, under your control, and not in the cloud. Your information remains yours, with no risk of tampering or hacking in the cloud. Humetrix doesn’t share or sell your personal information. 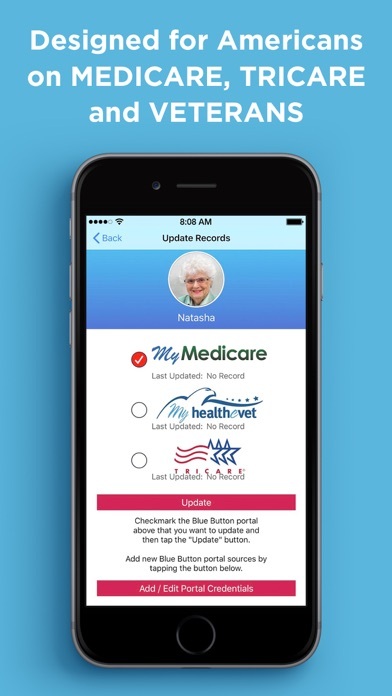 iBlueButton is offered with two subscription choices of either 1-month or 1-year to receive ongoing safety warnings with your periodically updated Medicare record. After a 1-month free trial, payment for the Service Subscription of your choice will be charged to your Apple ID account unless it is canceled at least 24 hours before the end of the trial. The Subscription automatically renews unless it is canceled at least 24 hours before the end of the current period. You can manage and cancel your subscriptions by going to your account settings on the App Store after purchase.